Today I have an upbeat project to work through with you today, and it all begins with a magical transparency that I got as a freebie from E-Scape and Scrap and made by one of my favorite designers, G & T Designs. When I first saw it I thought, “Na, I don’t want that; I’ll never use it.” I did download it though and came across it while I was looking through backgrounds. When I saw it that time I fell in love with it and thought it absolutely perfect for this project. I had to flatten the image to post it here, but the original is a transparency where the windows have been masked out. The theme of the finished piece I hope elicits the joy and freedom of biking, and it’s called Grab life by the handlebars. It has many layers, elements and groupings so let’s get started with some of those. Below are the papers used in addition to the main background and all of the elements. I began with a new white layer in PS size 12 x 12. To that layer I added the butterfly layer that I duplicated twice putting an oil paint filter on one dupe and a find edges filter on the other. Blending mode and opacities are shown above. I then formed a group from those three layers. The main layer was added along with the white crinkled paper and the brown overlay to add some color. I quick-selected the window area, created a mask for the butterfly group, and painted out the part of the butterfly group that appeared in the window. The photo behind the window is a free image found on Creative Commons, which I duplicated putting a find edges filter on the dupe. The original photo was set to multiply mode with an opacity of 55%, and the dupe was set to multiply with an opacity of 75%, so the photo actually looks more like a drawing. I made a group from the photos, and again I had to select the window frame and mask out the parts of the photo that overlapped. The red bike was placed in the window frame. Then it was time for the really fun stuff. I composed a yield sign that had a ‘To Bikes’ sign (made with the small brown paper and text) and a Bike Route sign clamped to it, and I made a group from these elements, so they could be moved around as a whole. I took the lines of stitching and cropped out the line I wanted, which I placed along the bottom edge of the brown overlay to make it look like a road, and placed the blue bike, to which I had added a basket of flowers and made a group of them, onto the ‘road.’ The yellow tricycle tries to keep up behind it. The birds flew in next…a bluebird on the window sill, a hawk in the sky high above and some little birds on a wire. I only wanted one line of the birds on the wires, so I set the blend mode to darken, which hid the white background, created a layer mask and painted out all the other wires and birds. This I tilted a little and added the text, ‘Be free. Be happy.’ above tilted at the same angle. Under that text came another line of text, ‘Grab life by the handlebars,’ with an underscoring of twine and some black hearts, all grouped and then one more text line ‘and FLY’ also grouped. Finally I added the red hearts in the upper left and another line of stitching across the top. Just because. And here’s how it looks. Makes me happy. And I hope you like it too. Tip: In the previous post I talked about collecting all the images, backgrounds, and elements you can get your hands on, and I forgot to mention the very simplest of all. Scanning. Scan fabrics, leaves, flower petals, your own scribbles & doodles, anything to which your imagination takes you. British artist, surrealist painter and novelist. Tip: Before I introduce a new piece today I want to say a word to photographers who are interested in taking their work into the realm of the photo artist; a place of creativity, individuality, and sometimes if we’re lucky, a little magic. The very first order of business is to become a collector- of papers, textures, elements; anything that might bring life to your piece. I literally have hundreds of papers, textures and things as well as my photos. Many textures & backgrounds can be gotten free by googling ‘free photo backgrounds.’ Free images can be found at https://creativecommons.org. When I’m looking for something new I purchase papers & kits, and one of my favorite places is https://e-scapeandscrap.net/boutique. You’ll find many sales and occasional free items, and this is a great site for scrapbookers. Once you’ve collected images and elements the next order of business is to organize them into folders. I have folders for Papers & Textures, which I have sub-divided into categories of Colors, Edges-Frames-Overlays, Splotches, Scribbles, Scratched Surfaces, Brushes & Text, Clouds-Moon-Stars just to name a few as well as folders called Critters, Botanicals, Patterns-Graphics-Icons, and Victorian-Steampunk. ‘The Sound of Silence’ is the title of the piece I’ll be working with today, and we’ll start with the finished image and work backward. The image begins with a gray speckled paper, which I duplicated twice putting an impressionist painting filter on one layer and an ink-watercolor filter on the other. Blend modes and opacities are shown on each. Once the base layer is in place I add a very nice grungy gray/blue background and a sunspot. A photo I took on the Okefenokee swamp is cropped, reversed horizontally, duplicated, and blended in luminosity mode at a 50% opacity. The duplicate is given a sketchy watercolor filter, blended in soft light mode with a 75% opacity. Next come the flying geese and the text. The text was blended in hard light mode at 40% opacity. The final touches include the addition of a gorgeous blue/brown background and a starry background. Finally the panel layer from Photoshop. The layers were not originally placed as they are here, but this is the final stacking before the image is flattened. Been working most of the day to catch this piece up from where we left it in the previous post, and below are the animals I foretold would be trotting into this scene (along with a birdcage for the two little ones). All of these are .png files (already extracted/isolated). Finally we’ll create some drama with the following overlays ordered and with opacities as shown below. Here are the layer panels and all that we finally have in this royal house. Now called Une Maison Royale. After a very long hiatus we are back with a new name, a new look, and new directions. We hope this will be an exciting place for photographers, photo artists, and art lovers alike as we share our images and art pieces with tips, how-to’s, and works in progress. We’ll also be happy to answer questions. Starting off then with a new piece called ‘Scarecrow’ posted yesterday in our Etsy Shop and just in time for that most fun and spooky of occasions. Work begins in Photoshop CC and assumes the readers basic working knowledge of the program. Scarecrow itself began with the main background layer and some elements that I purchased as a kit. Two more backgrounds and a cloud photo were added for texture and color, blended in soft light for the first two and overlay for the clouds. Opacities were adjusted and portions of each layer masked out. Next came the addition of various elements, first the train, the tree behind the train, the skeleton beside the train, the sign, chair, chest, candle, and all of the various darker crows. Some leaves were scattered under the chest. Finally we have the piéce de résistance, the king of the crows; the steam punk crow. He is the product of playing around with several images to fit them into the look I was after. I selected these layers and made a group, which allowed me to move them around as a unit once they were placed in the image. Here’s what I used and how it turned out. Tip: When photographing jewelry for your shop or site keep the background as uncluttered as possible. Don’t photograph jewelry on wood, rocks or shells as these backgrounds tend to obscure the piece. Use neutral colors for the background, focus on the piece and get as sharp an image as possible. 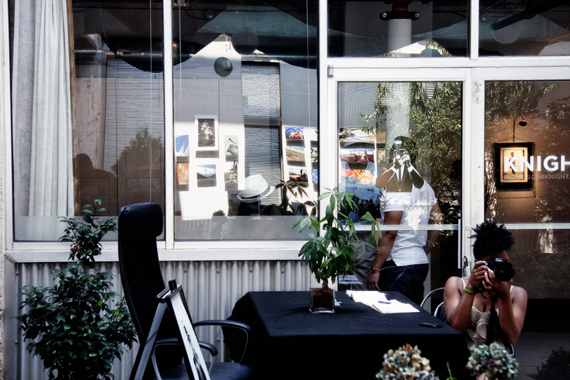 This entire ‘pay for a booth and be in an art festival’ experience was breaking new ground for us, and with only ten days to prepare it felt pretty intimidating as well. What and where was the Old fourth Ward? 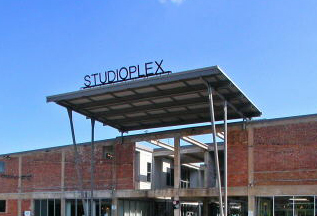 What and where was the Studioplex complex that was host to StudioFest? And what was StudioFest itself all about? What would the booths look like? How many photos should we bring and how would they be displayed? Well it was an experience of ‘learn by doing’ all the way, and here are some of the things we learned. So what exactly is The Old Fourth Ward, and where in the world is it? Commonly referred to as O4W, the Old Fourth Ward is best known as the location of the Dr. Martin Luther King, Jr. National Historic Site. 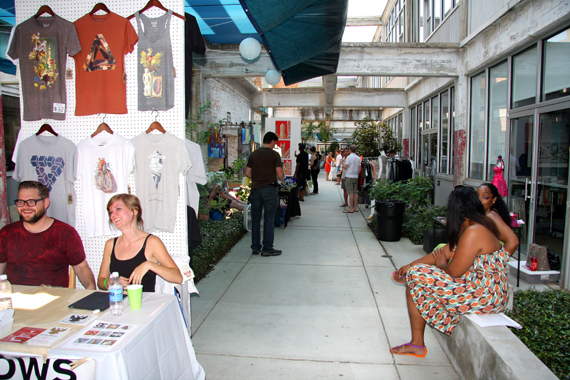 The building that now houses Studioplex Lofts, a complex of residential lofts and retail shops & galleries within O4W, is part of the gentrification effort in this community. It’s a picturesque collage of historic structures…original brick, fire doors, and exposed overhead beams with peeling paint curls like the bark of a birch tree…meeting contemporary needs. Something of a vintage grunge feel to it. Built in 1906 the building was originally part of the South East Atlantic Cotton Compress Warehouses. A water tower across the street, which is part of the complex, served as the water source for these warehouses. And what the heck is StudioFest, and how did it fit in? 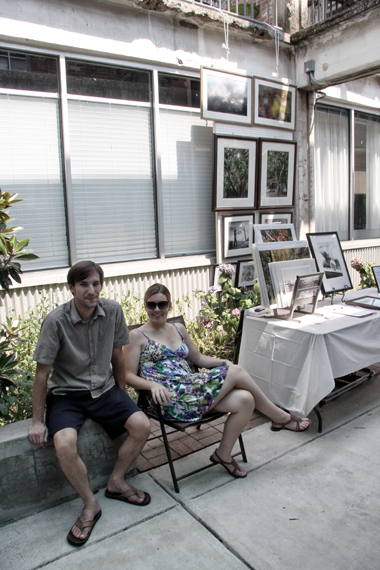 We were contacted through our Etsy shop by Geoff & Christina Lee, owners of the gallery Modern Now, to participate in an art festival called StudioFest, this first of which is to become a biannual event. We would have a 6 foot table and two 4 x 8 peg boards as display space…no chairs, and no hooks for the boards. How could one hang mounted photos from s-hooks on peg board, we wondered, when Craig had an ‘aha’ moment and saw that we needed squared hooks on which the photos would sit at just the right slant. He found and bought those, and they were perfect, but we certainly weren’t going to stand all day in 100 degree temperatures, so we made a quick trip to Walmart to buy two folding chairs…possibly the best decision of the day. We set up our booth with photos, business cards, and an email sign-up book laid out on the table with more photos displayed on the peg boards behind. We unfolded our brand new red chairs, stocked them with water and wet cloths, and dug in for business. Alas, we never did make any sales that day, but that isn’t to say we didn’t do any business. Although the lack of sales was disappointing (the expense, all the prep, all the hours sitting in the heat, not to mention the fact that we quite love our work), we found ourselves in excellent company. All the booths were eye-catching, and many of the items for sale were stunning, but from what we gleaned walking around and talking to other artists and crafts(wo)men, no one fared much better than we did. Especially hard hit were we print artists…the painters & photographers. No one of us could find just one convincing explanation for this global lack of sales. Speculations ran from the oppressive heat to wondering if the turnout was fewer than expected. Maybe people didn’t have money to spend and were instead looking for a unique setting to pass a few hours on a Saturday afternoon. Or possibly those who did turn out were were looking for something trendier. We considered the fact that the beer table was placed at the entrance, enticing people to hang out there socializing and listening to the music, only to stroll around the venue as a second thought. Maybe it was the table of Serpas Restaurant where people were more than willing to pay for a taste of Louisiana & the American Southwest. We simply don’t know and never will…the difficulty being that we can’t know if we could have done something different. We most definitely did ‘do business,’ though, as I said. 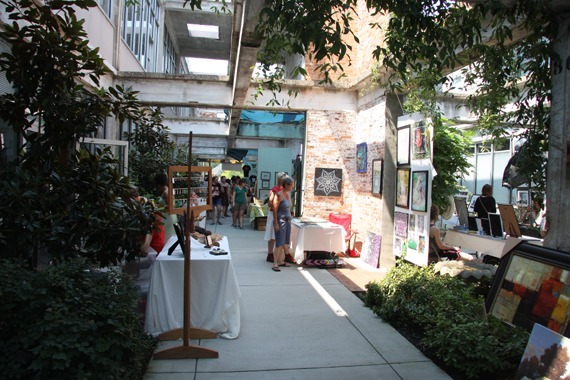 We experienced our first art fest as a part of the artist community, and we met many fine artists, crafters, and jewelry-makers. 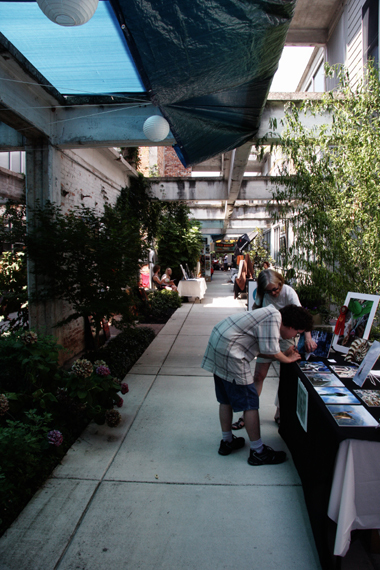 We made a lot of contacts, including a couple of galleries that may be willing to host our photos, and we were delighted at the opportunity to hear the many accolades spoken by those who stopped at our table to admire (if not purchase) our work. And, finally, we were invited back in September. 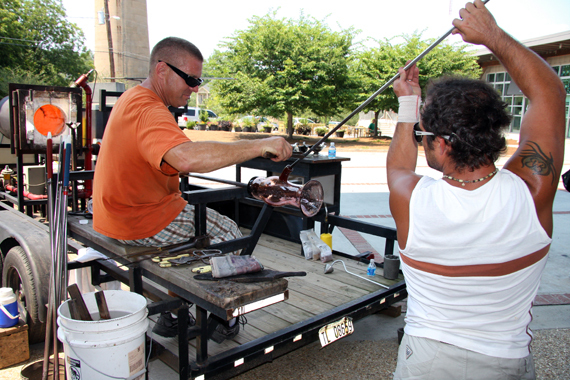 Many thanks to Geoffrey & Christina of Modern Now, Walt Woodall of Metro Gallery and Framing, and to all the volunteers for StudioFest. I never saw people work any harder than these folks…under pressure, with little sleep, and in sweltering temperatures. Awesome job, guys! We had a lot of fun. Studioplex complex that was host to StudioFest? 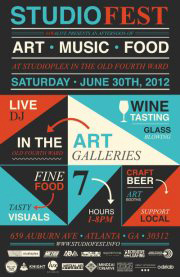 And what was StudioFest itself all about? What would the booths look like? How many photos should we bring and how would they be displayed? Well it was an experience of ‘learn by doing’ all the way, and here are some of the things we learned. Many thanks to Geoffrey & Christina of Modern Now, Walt Woodall of Metro Gallery and Framing, and to all the volunteers for StudioFest. I never saw people work any harder than these folks…under pressure, with little sleep, and in sweltering temperatures. Awesome job, guys!